If you have some magic string, then you would be able to do this … Wait … STOP … I’m joking. This magic string trick makes use of a leftover string you may have lying around somewhere. This is a great simple magic trick and it can win you some extra points with your parents or significant other for tidying the house. This is a great win-win trick that I suggest you give a go. 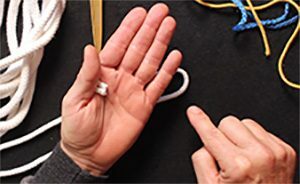 The magic string trick will teach you the core principles that are involved in the classic cut and restored string trick and it will also show you how to use props to reduce stress when you are trying to pull off something a little sneaky. Holding the scissors and the rope in opposing hands will work wonders to help you relax while performing this magic trick. If you want a do a test, try doing each step with the hidden elements. You will find that you are much more relaxed when you have nothing to hide. Then try doing it including the secret move and then repeat those moves exactly. You will notice that this time you will be sweating a little more as you have something to hide from the audience. This is because, as humans, we are not very good at lying even if it is simply for entertainment. When I began magic, this turned out to be a problem for me. I would feel very uncomfortable and I would sometimes give away the secret just so I didn’t have to carry the burden of lying around with me during a performance. With time and practice, I was able to get over this problem. Feel free to give this easy magic string trick a go and practice lying with a smile and know that you are making someone’s day a little better by doing so. 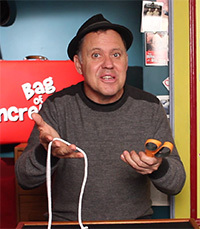 Did you enjoy this Magic String Trick? To learn more simple magic tricks Click here!